GERMANY: Adwen, the forgotten child of Siemens Gamesa Renewable Energy (SGRE), has announced a round of job cuts in Germany, as part of its parent company's cost-cutting programme. Adwen said 260 of its 480 positions in Germany will be cut over the next two years with its management set to begin negotiations with workers representatives. The cuts form part of the 6,000 jobs reduction announced by SGRE in November. It also follows the closure of Adwen's blade production at its facility in Stade. Adwen has been mothballed following the merger of the former joint venture's partner Gamesa and Siemens in 2017. SGRE has taken on Adwen's pipeline of orders — mostly in France — and Adwen has not signed any more turbine orders since the merger. SGRE has also announced it would not continue production of Adwen's 8MW turbine, opting to focus on its own Siemens-designed model instead. "The lack of new orders has put Adwen into this difficult situation. In conjunction with excess capacities and the increasing cost pressure in the wind industry, the intended changes are inevitable", explained Adwen CFO Hans-Rolf Huppert. Adwen launched a restructuring programme in July 2017, part of which saw CEO Luis Alvarez leave the firm. As part of the restructure, Adwen created two entities. 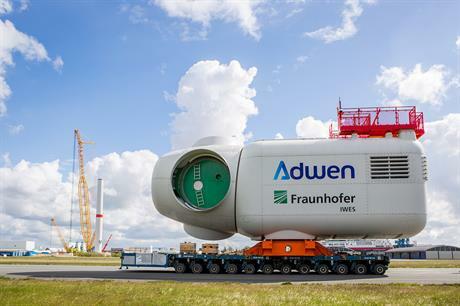 Firstly, Adwen Operations focuses on servicing the four operational projects in German waters, which use Adwen and Areva (the other joint venture partner, prior to the Siemens Gamesa merger) turbines. It completed installation of 5MW turbines at the Wikinger offshore site in Germany in October. Today, Adwen said it would retain the Bremerhaven base for its servicing activities. The second entity would focus on the 1.5GW of French projects, which earmarked Adwen turbines. However, SGRE has since taken on the turbine supply deal for these projects.